Santa Cruz in an anonymous portrait - now in the Museo Nacional del Virreinato, Tepotzotlán, México. Manuel Fernández de Santa Cruz y Sahagún (18 January 1637, Palencia - 1 February 1699, Puebla) was a notable religious writer and Roman Catholic prelate who served as Bishop of Tlaxcala (1676-1699) and Bishop of Guadalajara (1674-1676). As well as founding charitable institutions in his diocese, he published Sor Juana's Carta atenagórica (crititquing a sermon by António Vieira) - as well as publishing this without her permission (albeit under a pseudonym), he told her to focus on religious instead of secular studies. 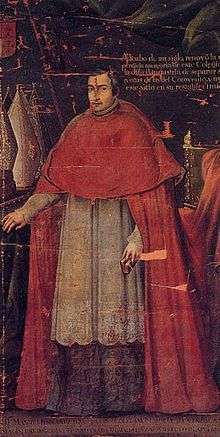 Manuel Fernández de Santa Cruz y Sahagún was born on January 18, 1637 in Palencia, Spain and ordained a priest in 1661. On February 19, 1674, he was selected by the King of Spain and confirmed by Pope Clement X as Bishop of Guadalajara. He was consecrated bishop by Payo Afán Enríquez de Ribera Manrique de Lara, Archbishop of México, with Juan de Ortega Cano Montañez y Patiño, Bishop of Durango as co-consecrator. He was installed on September 29, 1675. On March 31, 1676, he was selected by the King of Spain and confirmed on October 19, 1676 by Pope Innocent XI as Bishop of Tlaxcala. He was installed on August 9, 1677. He served as Bishop of Tlaxcala until his death on February 1, 1699. Antonio de Arriaga y Agüero, Bishop of Yucatán (1698).